After today’s idiotic 300 point move on the TSE, the predictions on this stock are now increasingly more plausible. Check previous blogs, but the story essentially was that it could not go lower than $22.50 and even at $25 should gain some $8. I am myself always amazed how accurate this stuff (EW) often is. I cannot afford detailed tick charts so I assume that wave a was a 5 wave move. 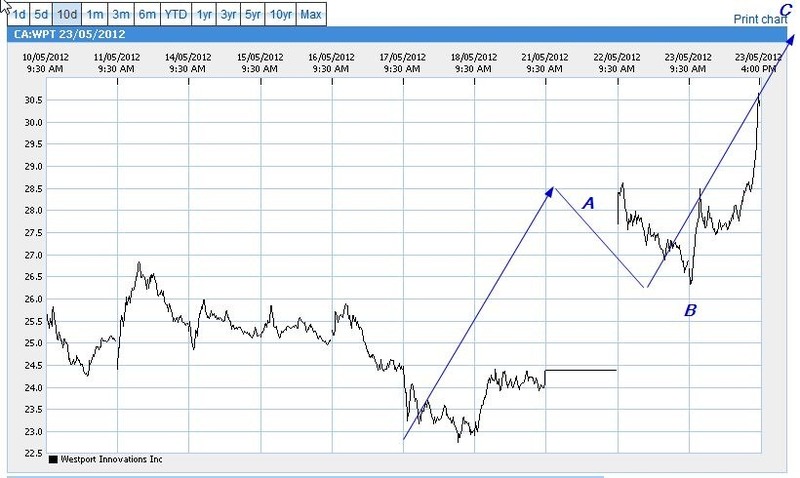 Wave B to about $26 as predicted occurred yesterday. Wave C probable completed wave 3 of C and will have a minor pullback in the morning followed by the 5th. That should take it to the anticipated $32/33 level. $8 on $24 is roughly 30% absolute. but as they say in Holland, don’t sell the skin before you shot the beast. Anyway a sell at around $32. For the sake of a good understanding, that does not mean that the stock cannot go to $300, whatever, it is just not the thing we understand at this time.